December 1st is World AIDS Day. A few days ago a friend shared with me a video by singer Annie Lennox in which she talks about her SING campaign raising awareness for women and children suffering from HIV/AIDS. 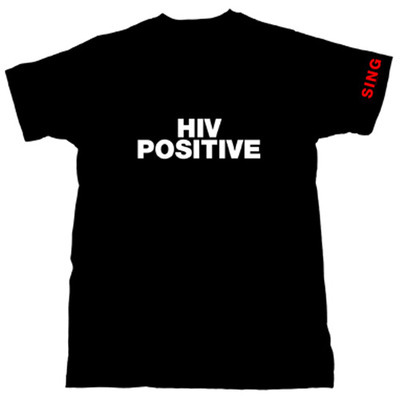 In the video, Ms. Lennox appears in a t-shirt that boldly proclaims “HIV Positive” on the front. Now, the fact of the matter is that she is not HIV positive. Her point, though, is that the disease continues to be stigmatize those who are infected. This stigma is unwarranted and negatively impacts both the quality of life and the access to treatment for people with HIV. The video and t-shirt got me to thinking. Why is it that when I considered whether I would wear one of these shirts, I had a momentary hesitation? I comfortably wear t-shirts that proclaim all sorts of other things, but what reactions might I experience if I wore this shirt? That hesitation highlighted for me that the stigma remains very real and something we must all continue to work to erase. May the need for a World AIDS Day soon be no more. This entry was posted in Uncategorized and tagged AIDS, Annie, HIV, Lennox, SING, World AIDS Day by christao408. Bookmark the permalink. Absolutely. I agree. And to further comment on your post, I love Ms. Lennox for her artistry and craft, but even more for her campaign and dedication to raise awareness about HIV/AIDS. hmmm..now that i think about it, i think it would take a measure of courage to wear that shirt….but to that same degree, i think that it’s a good thing that it brings the disease to a forceful light. AIDS is not only a medical condition…but also, a byproduct of many social conditions that prey mostly on the poverty stricken and uneducated ensuring its rapid spread. as strange as it is to say, we must put a human face on AIDS to remind the world of the urgency by which the problem must be solved. i think this shirt does that well. a good friend of mine died of AIDS, and i’ve seen it’s slow and irreversible effects. it is not a joke. I think it’s gotten better yet we do have a long way to go. If people stay steadfast in educating others about HIV and as it spreads start to touch more people’s lives personally it will get better. Great blog! When I think about whether I’d wear it or not, I hesitated too.But on a broader scale, would I wear a T-shirt that says “STD Positive?” I don’t think so.I’d like to help raise the awareness for say for example, breast cancer, but I don’t think I’ll wear a shirt that says “I have breast cancer.”Lastly, I think the stigma associated with HIV/AIDS is partly similar to those associated with other STDs. But perhaps since it’s untreatable and is related to death, the stigma is worse. The hesitation makes sense. I would too. I’m totally there with you on the hesitation man. It definitely makes you sit back and wonder how many social stigmas you have embedded in your brain… (capitalism is secretly brainwashing all of us… shhh….. =P) you hit a great point with this post. mad propz! Yes I too lost a good friend to AIDS. And I would wear this tee. It’s past time we got over the stigma that this disease carries. It’s a MEDICAL condition, not a moral failing. I wouldn’t wear the shirt, mostly because I’m really picky about clothing and don’t usually like text. xDThat aside… I’d probably wear it, but I’d feel awkward around certain people while doing so. I admit to hesitating wearing the t-shirt. Yes, there is a stigma associated with AID – social and medical. I watch a good friend of mine die from pneumonia which was contracted because of his infection.I don’t want to do that again. And yet I hesitated. give me the shirt and i’ll wear it. i really don’t care whatever negativiy i’ll be hearing. if someone asks, i’ll tell them the whole story. but if it’s just blabber, then they need to open their minds a little more. good job on ms. lennox for the awareness campaign.btw, i like what you said last – may the need for world aids day be no more. I think I would hesitate to wear it.. :/It’s a great idea, though. I would probably hesitate to wear it, but I agree we need to work on getting rid of the stigma attached to being HIV Positive. I have no problem wearing that lovely shirt. I think wearing it shows your care for those HIV positive patient and that you accept them in their illness! @Southeast_Beauty – @Renatojr3 – @xxSHhHxxBExxQUiETxx – @lonelywanderer2 – @Chemalexandru – @murisopsis – @epiginoskete – @Fatcat723 – @stevew918 – @unabridgedtales – @VilaSpiderHawkAuthor – @bengozen – @alwateen – @Roadlesstaken – @yang1815 – @notjus4ne1 – @ThePrince – Thank you all very much for your thoughtful comments. I enjoyed this opportunity to reflect and to share my thoughts. From almost the time I came out nearly twenty years ago, I have had had friends who are HIV positive and have witnessed the stigma they face. But there was still a whole new level of awareness when I asked myself the question about how I would feel wearing this shirt. It serves as a good reminder for me. I’ve always admired Annie and here’s just one more reason to do so. I had to think hard about wearing the tshirt and admit I’m torn. I couldn’t find a men’s version in her site though. I see there are other places offering thattshirt but not this version. LOVE annie and love this idea. i’m ordering the shirt not only to show solidarity but to remind myself to think beyond my little world. great post. here here. let’s hope so. i think it’s safe to say the rest of us are on the same page with you. @AppsScraps – She’s a good example of an artist who uses her fame to constructive ends. @caki730 – I’m so glad you enjoyed it! @rudyhou – At least as far as the last line of the entry goes. The t-shirt wearing seems to be a bit more controversial. she’s so outspoken and intelligent and passionate. love her.